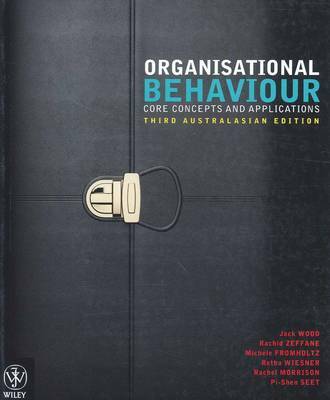 Organisational Behaviour: Core Concepts and Applications, 3rd Australasian Edition is the ideal text for a one-semester Organisational Behaviour course. Fourteen concise, relevant and tightly focused chapters are designed to engage rather than overwhelm students, and the highly visual presentation further enhances the text’s appeal. Numerous real-world examples throughout the text examine how organisations in the Australian, New Zealand and Asian region are responding to contemporary business issues such as: The increasing focus on sustainable business practices Employee stress and work/life balance Workforce flexibility and casualisation Generation Y and the ageing workforce Skills shortages Globalisation Telecommuting Outsourcing Diversity in the workplace The ‘24/7’ nature of contemporary communication technology, including social media Complemented by the latest research in the field, this text provides a thorough analysis of contemporary organisational behaviour. The iStudy contains interactive modules and local videos to enhance your understanding of key concepts. Each interactive module contains a summarised version of the textbook with the inclusion of audio voiceover and interactive activities designed to test your knowledge and assist your learning.